The past couple weeks have been great. Saoirse is doing really well, and even went a whole week without any nausea meds no problem! I think it even helped her go back to sleeping 12 hours a night (which makes her AND us very happy indeed)! On top of that, I'm finally starting to feel better after being so wiped out for so long. I think I can finally see the end of the tunnel, and I can't wait to start feeling more normal. To celebrate my remission and Saoirse's first birthday, we had some friends over for a backyard BBQ. Mike was very excited to smoke some pork and some ribs, and I was glad that many of our friends and family could come and celebrate with us. It was such a nice day! We set up the back yard and everyone enjoyed the shade and great food and fun. My Nana was even able to join us for awhile. It was the first time that she had been out since she had broken her leg a couple of months ago. She was so excited to be out and about, and to see everyone as well. Saoirse had a great time running around and playing with one of her friends and the girls next door. She has really come to love playing outside, and it was nice to have her out of the house all day. Sadly, only one of her baby friends was able to join us. A couple had other commitments, and a couple had gotten live vaccinations during the prior week, and we both have to avoid live vaccines because we have no immunities. But, we will be sure to celebrate with them soon. Over all, the party was a nice hurrah before we had to take Saoirse back into the hospital for chemo number 4. 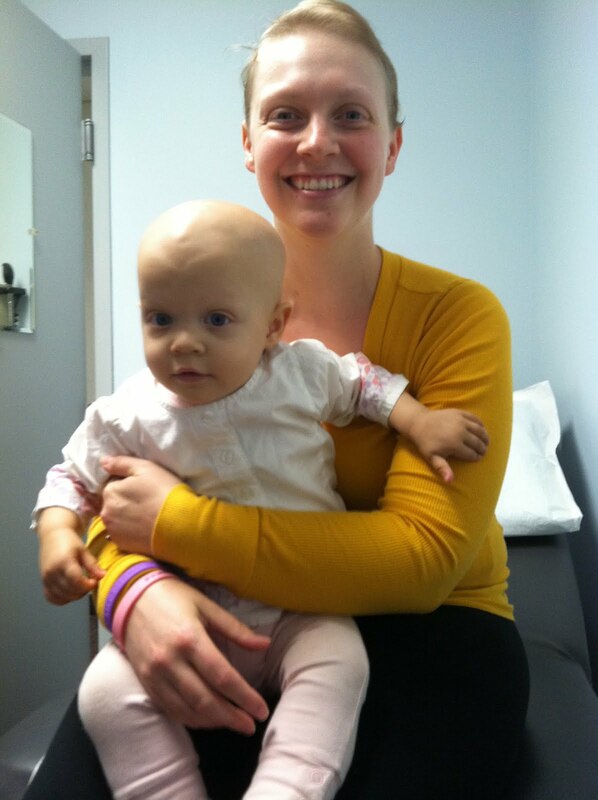 Monday we went into the Jimmy Fund for our doctor's appointment and to start the next cycle of chemo. I had called last week to make sure that we were all set to be admitted when we go there, and they said we were all set. I had thought that this cycle was the same as the last, but we found out that this one is different drugs. We also found out that we could not start the drugs in the clinic because one runs for 3 continuous days (a full 24 hours for each of the 3 doses! ), and they can't transfer her over to the hospital with drugs running. So we waited for our bed, which we didn't get until 2, and then waited another two hours to even be seen by the doctor so she could be admitted and start the chemo. After everything, she didn't start her premeds until 5 pm! We were very frustrated. Why did we have to get there at 9 am when we weren't going to be doing anything until 5! We made our frustrations known, and were able to talk to the doctors about not letting this happen again. As it was explained to me, there was a miscommunication at the hospital about our admission and they didn't know we were coming, so they didn't have the room ready. This is just amazingly frustrating considering that I called the clinic last week to be SURE that our admission was all set up (especially after the last time when we didn't go in until a day after we thought). Sadly, there was nothing we could do about it then, but the doctors have assured us that they will make every effort to start her chemo earlier when she has these drugs again in cycle number 6 (cycle 5 is the same as cycle 3). Saoirse is doing amazingly well with this cycle so far (granted, we are only in reality 1 day in because everything started so late). She woke up hungary this morning, which means she wasn't experiencing too much nausea. She ate a lot of good food today, including waffles and cherries and lots of milk (another good sign, as milk is usually the first thing she won't drink when she's nauseous). She even took a two hour nap in the afternoon! The one difficult part is that she is attached to the pole all the time. This particular one runs through two pumps at once, so the pole is very large and awkward. If she would sit in her crib, or on the floor and play in one spot, this would be easier to manage. However, she is an energetic one-year-old, and doesn't like to sit still much at all. Chasing her with the pole and trying to keep her from getting tangled in three tubes attached to her is a feat in itself. I think it's probably more exhausting for the one doing the chasing than it is for her (sad, because it would be good to tire her out!). But it's only for three days, and then she will be home and happy to be here. Hopefully tomorrow will be as good a day as today. Kezia, I have just finished reading all your blog entries and can only say, you are an amazing woman. When I saw your parents at this year's dance recital, I was eager to find out how you were and how your parents were enjoying being grandparents. When your Dad told me what was going on with you and Saoirse, I couldn't believe it. You all been in my thoughts since then. I am so relieved to hear that you have finished your treatments. I am looking forward to your celebrating Saoirse's ending her treatment as well. It's great to see how you can live a normal life despite of the desease! Birthday party, friends around, everything sounds great! But I think the greatest party will happen when both of you get over cancer and treatment! Great journey to you!